Graffiti South Africa - The definitive African graffiti and street art website. Established in 2011, GRAFFITI SOUTH AFRICA aims to promote street art and graffiti within South Africa and abroad. We provide artists with a platform to display their work, urban art fans with their fix of the latest and greatest, and businesses with a host of services and reliable artists for any project. Want a mural to brighten up your office environment, event or personal space? Fill in our request form and we can arrange the perfect artist for your job - anywhere in SA! Past clients include Nike, Standard Bank, Homemakers Expo, King Price Insurance, Jameson, Ster Kinekor, Logitech and Joe Public. If you have anything to contribute, such as your latest painting, then please send it our way. We are always keen for additional content and would love to share your artwork or photography. In 2014, Cale Waddacor released the first book on South Africa’s vibrant graffiti and street art arena. Published by Schiffer Books in the USA and available worldwide. Speak to your local book store or purchase a copy online. 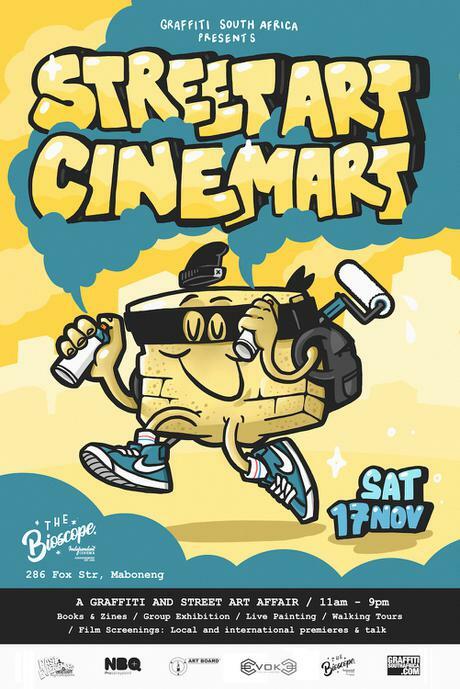 Street Art Cinemart is our annual event promoting graffiti films, books and zines with a live painting demonstration and group exhibition highlighting the country’s leading urban contemporary artists.